More thoughts on the movie Snowpiercer, which I commented on in Inuit Woman in Snowpiercer and Ending in Snowpiercer. Snowpiercer had some plot and character problems, but I'm interested in the scientific and technical problems at the moment, so let's go. 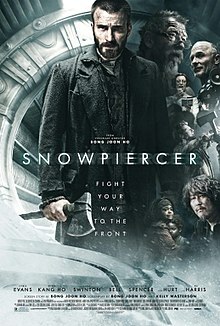 It would've been nice to say how Snowpiercer crossed the oceans in its round-the-world journey before the Earth froze. It would've been nice to say what Snowpiercer's energy source was. I presume it was nuclear-powered, but I don't think it was ever stated. An ice age wouldn't stop earthquakes or volcanic activity from happening. I imagine a worldwide system of tracks could go only a year or two, at most, before something jolted the rails out of alignment. I think the movie gave some bogus reason why the train had to keep moving. Something about perpetual motion, maybe. Even if we grant that condition, there's no reason it had to go at top speed. Going slower would use less energy and reduce the chance of accidents. The train's rulers knew the outside temperature well enough to calculate that someone's arm would freeze in exactly seven minutes. Yet they didn't know the outside temperature was rising--enough so that people could survive outdoors. That's contradictory and therefore illogical. In fact, the train's rulers should've had scientists monitoring the conditions outside. And they should've been glad to stop the train and send people outside--perhaps as punishment. Operating the train with ongoing social inequalities was like sitting on a ticking bomb. Eventually the system would explode. The "tailies" had to use the last two matches in existence to start fires. FYI, you can start fires without matches or lighters. For instance, you can strike rocks or rub sticks together. I forget about the kidnapped children for a while, which is a storytelling flaw. And I didn't buy the answer to their disappearance: that they were serving as manual replacements for broken parts. I thought the children were being taken to provide food--the Solyent Green cliché--or perhaps as slaves or pets. The replacement-part idea was unexpected, to be sure, but unbelievable. First, kids would last for only a few hours in those hot, cramped cubbyholes before they passed out. No way could they perform the same repetitive tasks for weeks or months. Second, the train must have millions of parts and materials that would wear out or break. It inevitably would require fixes that a human child couldn't manage. Like other self-contained vehicles--a ship, submarine, or starship--it would need mechanical engineers, machine-shop facilities, and probably a "docking port" where it could stop for repairs. To give a related example, suppose your car ran out of brake fluid, a spark plug broke, or the battery died. This isn't a Flintstones cartoon where an animal performs every function. No living creature could substitute for the mechanical failure. Overall, though, I enjoyed Snowpiercer. It deserves some Academy Award nominations and I hope it gets some. For its bold subject and style, I give it an 8.5 of 10.